"A very flavorful lemon chicken. Easy to prepare and quick to cook. Serve with rice, salad, or potatoes and a green vegetable." Whisk 1 cup lemon juice, olive oil, and marjoram together in a large glass or ceramic bowl. Add chicken and toss to evenly coat. Cover the bowl with plastic wrap and marinate in the refrigerator, stirring occasionally, for 2 hours. Remove chicken from marinade; discard marinade. Heat vegetable oil in a skillet over high heat. Cook chicken in hot oil until almost burned on each side and no longer pink in the center and the juices run clear, about 4 minutes per side. An instant-read thermometer inserted into the center should read at least 165 degrees F (74 degrees C). 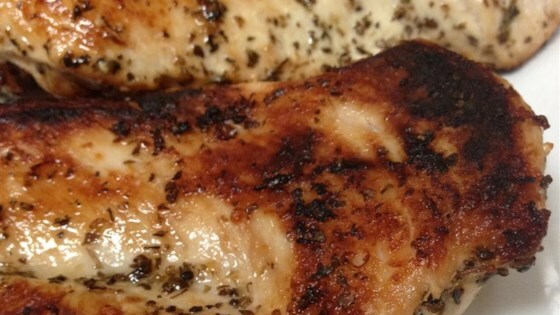 Remove skillet from heat and sprinkle chicken breasts with remaining 1 tablespoon lemon juice. A flavorful and easy summertime zoodle dinner! If preferred you can cook the chicken for the last few minutes in the marinade; just make sure the marinade comes to a boil. The nutrition data for this recipe includes the full amount of the marinade ingredients. The actual amount of the marinade consumed will vary. Very flavorful! I added a little basil but that was really the only change I made. Leftovers were great on salad the next day. Wont use the maranade at the end but will make this regularly.